POP GOES THE UNIVERSE If extra dimensions were large enough, a universe with different laws of physics could bubble up from the death of a black hole. That would be bad news for us: The new version would be uninhabitable. This could be the way the world ends. First, a pair of cosmic protons smash together at unimaginable speeds. The tremendous energy of their crash would create a tiny, ephemeral black hole, so small that it would last just a fraction of a second before evaporating. Where the black hole just was, a bubble of space with entirely different laws of physics than the universe we inhabit would begin to grow, expanding ever-outward at the speed of light. In its wake, atoms would disintegrate, and the universe as we know it would fizzle out of existence. 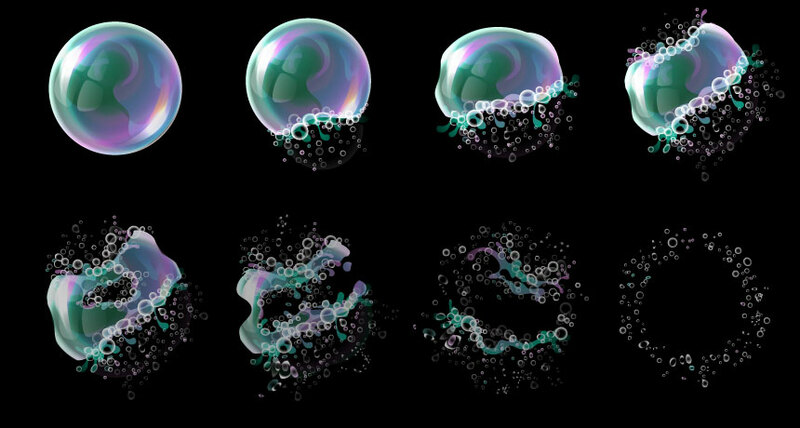 "If you're standing nearby when the bubble starts to expand, you don't see it coming," says Katie Mack, a physicist at North Carolina State University in Raleigh. "If it's coming at you from below, your feet stop existing before your mind realizes that." That horror movie can happen only if the universe has at least one extra dimension, on top of three of space and one of time. But this isn't the way the world ends - at least it hasn't yet. And so the fact that the universe hasn’t been destroyed by evaporating black holes puts strict limits on the size of extra dimensions, if any actually exist, Mack and Robert McNees of Loyola University Chicago claim in a paper posted online at arXiv.org September 13. Scientists have yet to find evidence of extra dimensions, a lack that suggests that any real ones must be minuscule. But their existence could help explain mysteries like dark energy and dark matter, and point the way to new physics beyond the standard model of particle physics (SN: 9/29/18, p. 18), so physicists are eager to probe their properties any way they can. Even tiny extra dimensions could have an influence on the universe, physicists suspect. For instance, gravity could leak into these extra dimensions, perhaps explaining why that force appears so much weaker than the other fundamental forces (SN: 9/29/18, p. 8). That leakage could also lower the bar for creating miniature black holes — at the tiny distances that the extra dimensions affect, gravity would appear much stronger. "If you have these extra dimensions, you don’t need to get as much matter in as small a space to make a black hole as you would without the extra dimensions," Mack says. That's why some people thought the Large Hadron Collider at CERN near Geneva might make tiny black holes when it turned on in 2008, but so far none have appeared (SN Online: 6/24/08). Nature can collide particles with even higher energies, though. The highest are found in ultrahigh energy cosmic rays, protons that zip between galaxies with energies higher than 8 billion billion electron volts (SN: 10/14/17, p. 7). That's 100 million times as high as the energies produced by the LHC. If collisions between those particles have made any black holes, then physicists could work out the gravitational reach of any extra dimensions, or how close you have to get to an object before gravity starts acting weird. This scenario has a dark side. According to a theory first put forward by Stephen Hawking in the 1970s, energy radiates away from a black hole until the black hole eventually disappears (SN: 4/14/18, p. 12). The smaller the black hole, the faster it evaporates, so any black holes made by colliding cosmic rays would fizzle almost instantaneously, or so the theory goes. That could be bad news for the universe. In 2015, theoretical physicist Ruth Gregory of Durham University in England and her colleagues showed mathematically that when black holes evaporate, they can nudge the universe into a state in which the laws of physics are so different that atoms no longer hold together. "No structures can exist," Mack says. "We'd just blink out of existence." This catastrophe is called vacuum decay. It relies on the idea that the fundamental nature of the universe, called its vacuum state, might not be the most stable one possible. There could be another configuration of physical laws, the true vacuum, that sits in a lower energy state. Evaporating black holes could provide the bump needed to create a bubble of this true vacuum, Gregory and her colleagues argued. And once some true vacuum exists, the space around it would want to join the true vacuum. The bubble would expand outward at the speed of light, taking the known universe with it. "The black holes are quite naughty," Gregory says. "They really want to seed vacuum decay. It's a very strong process, if it can proceed." That set of ideas leads to a paradox, Mack and McNees realized. Collisions between ultrahigh energy cosmic rays "should have happened thousands of times," McNees says. If extra dimensions exist, and if they are large enough for ultrahigh energy cosmic rays to make mini black holes, then vacuum decay should already have happened. The fact that we're here to wonder about it means that extra dimensions, if they exist, must be even smaller than previously thought. Mack and McNees calculated that any extra dimensions must be smaller than about 16 nanometers, or billionths of a meter. In other words, the gravitational influence of the extra dimensions would extend only that far. That's hundreds of times smaller than the previous best estimates and rules out some of the theories that let gravity leak into extra dimensions.